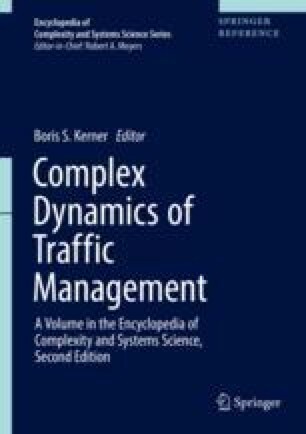 The allocation of traffic volumes to routes. A road with two or more intersections. Time interval in an arterial progressive system during which vehicles can travel unimpeded. A device which controls the sequence and duration of indications displayed by traffic signals. The establishment of a definite timing relationship between adjacent traffic signals. The time required for one complete sequence of signal indications. The time lost by vehicle(s) due to traffic interference or control devices. A device to detect the presence or passage of a vehicle in the roadway. The rate at which vehicles cross a given line on the road; the number of vehicles per unit of time. The time interval between successive vehicle crossings of a given line on the road.